Our two heroes build a new locomotive out of scrap. Peter and Grandpa’s miniature railway runs between their houses. They use it to visit each other and have had many adventures. The steam locomotive, Fiery Fox, is a wonderful machine, but takes ages to get ready. In this book an unexpected gift from an old lady comes in very handy. You may think that melting metal in a home workshop is far-fetched. Far from it. Grandpa Gerald, on whom these stories are based, built a mini foundry in a barn which could melt iron. His locomotive, ‘Invicta’, was built using home made castings. 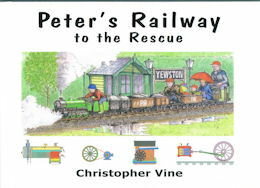 You can see him driving it in Peter’s Railway and the Forgotten Engine.